Economists Say Inflation Is Tame; Consumers Aren't Buying It On paper, inflation has been low this year. But consumers buying food or fuel may disagree. Prices for beef, eggs, fresh fruit and many other foods are much higher than overall inflation. Meat is displayed in a case at a grocery store in Miami. The index of retail prices for meats, poultry, fish and eggs was up 7.7 percent from a year ago — more than triple the overall inflation rate. Economists regularly issue reports calling inflation tame or mild, or some other word that suggests consumers shouldn't be feeling much pain. One example: "Inflation has been tame and this is providing households with some relief" from economic stress, according to an assessment done this week by PNC Financial Services. But if you happen to be buying gasoline or groceries, you may not be feeling relieved — at all. "It's kind of hard to even buy milk and bread," said Kimberly Acevedo, a bank teller who was shopping at a Best Market in Harlem. To search for lower prices, "you could find yourself going to four supermarkets ... one for meat, one for fresh fruit, and one for other things." The U.S. Bureau of Labor Statistics measures inflation by studying the retail price of thousands of goods, compiling the data into the consumer price index. For the past year, the CPI is up 2.1 percent. "That is below the historical average," BLS economist Jonathan Church said. "Since 1913, the CPI has increased at an average annual rate of 3.2 percent." So if you were to look only at the CPI, then you would conclude that inflation is low and consumers should be feeling pretty good at the checkout. But the government index covers a very broad array of goods, including globally produced items such as televisions, phones and personal computers, which have seen big price declines in recent years. So how often do you buy those big-ticket goods? Probably not as often as you put gas in the car or pick up meat or fruit at the grocery store. And those food and fuel prices are high this summer — far higher than the 2.1 percent inflation rate that the CPI shows. And the price increases are many times greater than the 2 percent average wage hikes that workers have gotten in the past year. 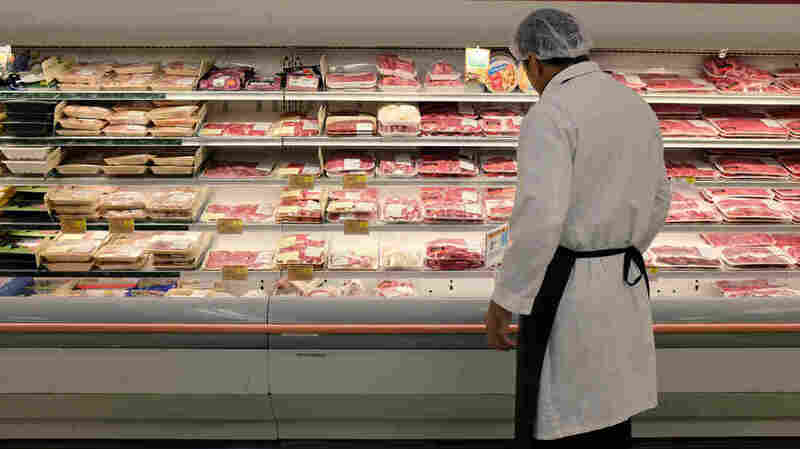 For example, in May — the most recent month studied — the index of retail prices for meats, poultry, fish and eggs was up 7.7 percent from a year ago. Some specific food prices really shot up: Eggs, oranges and beef all saw prices jump by double-digit percentages. And the U.S. Energy Information Administration says the price of an average gallon of gas is $3.68, compared with $3.50 a year ago, an increase of 5.1 percent. The reasons for these food and fuel price increases are both domestic and global. On the home front, the weather has been the key problem for grocery prices. Cattlemen in Southwestern and Western states have suffered heavy livestock and grazing losses after three years of extreme drought conditions. The USDA says the U.S. cattle herd has slumped to the lowest point since 1951. Because of the continuing drought, "cattle prices are at record levels that could result in declining profit margins for cattle feeders by summer's end. 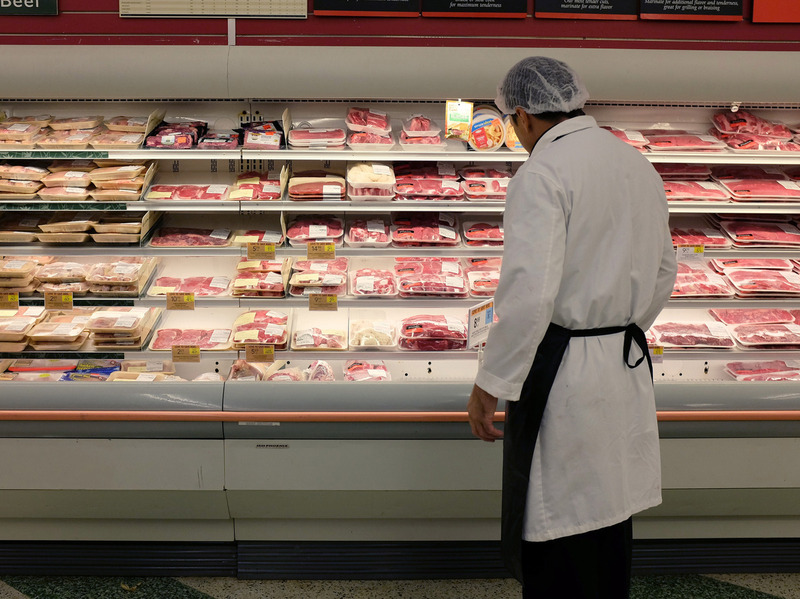 Consumers face record or near-record retail beef prices at the meat counter," the USDA concluded. That's not likely to change any time soon; the USDA downgraded its projections for beef production for 2014 by 155 million pounds. Experts generally say that even if the drought were to end today, it would take ranchers at least two years to rebuild cattle herds to more normal levels. And then there is a deadly pig virus that has been adding to meat-counter troubles. Porcine epidemic diarrhea virus, or PEDv, has killed more than 7 million piglets in the past year. And that, in turn, has sent pork prices up by nearly 13 percent at grocery stores, according to the USDA. Meanwhile, global events have been having an impact on gasoline prices. Political turmoil and violence in the Middle East pushed up oil prices this past spring. In recent days, crude oil has been hovering around $108 a barrel, up from about $100 a year ago. This week, the price of gasoline has eased by a few pennies a gallon in most places, but it remains elevated compared with last year. This summer's higher food and fuel prices are being watched by retailers hoping for stronger sales as students prepare for the new school year. Merchants fear that their customers will be feeling tightfisted when they come to buy shoes and notebooks. "Consumer confidence is likely to sour in July as food and pump price increases start entering the American consumer psyche; this is bad news for retailers that were hoping for a very strong back-to-school retail sales season," Chris Christopher, a consumer economist for IHS Global Insight, wrote in an assessment. New sales assessments from many retailers suggest that the higher prices for food and fuel already have been having a big impact on lower-income shoppers. For example, on Thursday, Family Dollar Stores said its same-store sales were down 1.8 percent this spring. "Our results continue to reflect the economic challenges facing our core customer and an intense competitive environment," CEO Howard Levine said in a statement. NPR intern Louis Enriquez-Sarano contributed to this report.